Specialists in Power Steering Rack, Power Steering Pump & Power Steering Box Repairs – Since 1972. The BMW Z4 steering system is powered by an electric steering column. 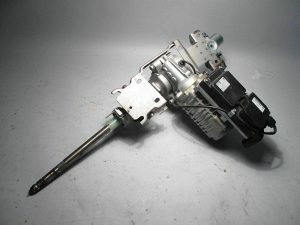 The electric power steering column works well in refining the steering and handling as well as increasing the vehicles fuel economy because unlike a conventional belt driven hydraulic power steering pump, the electric steering column does not rely on engine resolutions to produce it’s power and therefore does not drain as much power from the engine. If any of the above faults sound familiar and are becoming persistent, it will more than likely mean that your electric steering column is damaged or faulty. Going to a main dealer if the power steering column is faulty could cost you in the region of £800 + VAT (Plus labour + coding), and it may only come with a 12 month warranty. The alternative option would be to buy a used second hand unit, but the risk with this would be that you would have minimal information about the previous vehicle and how many miles were covered or how well the vehicle was maintained, therefore there is risk of the electric steering column failing again at some point. My BMW Z4 Electric Steering Column Is Faulty – How Can PSS Help? Here at Power Steering Services, we carry remanufactured units in stock as a direct replacement – so they will not require coding. They will be set to self-calibrate when fitted to the vehicle, and will also come with a Lifetime Warranty! You could also opt for us to repair your own unit, which will be done using only genuine OEM components when rebuilding your Electric Steering Column, to ensure that it meets & exceeds OE specifications. All our repaired and exchanged electric steering columns will come with Lifetime warranty and will require no coding. If you have a problem with your BMW Z4 Electric Steering Column, give Power Steering Services (PSS) a call today on 0208 853 3343. Tags : BMW Z4 Electric Power Steering (EPS) Column Part, BMW Z4 Electric Steering Heavy, BMW Z4 EPS Faults, BMW Z4 Faulty Electric Steering Column, BMW Z4 Steering Column Light On. Power Steering Leak: Can I Still Drive My Car? Ford Recalls 1.4 Million Vehicles For Steering Wheel Issues: Is Your Car Amongst These? © Power Steering Services 2016. All Rights Reserved.